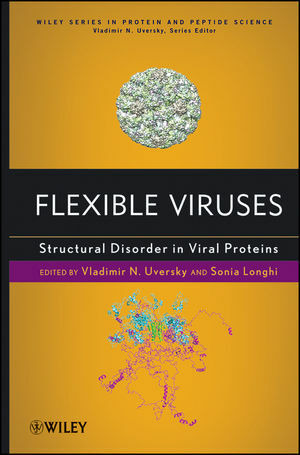 This book provides up-to-date information on experimental and computational characterization of the structural and functional properties of viral proteins, which are widely involved in regulatory and signaling processes. With chapters by leading research groups, it features current information on the structural and functional roles of intrinsic disorders in viral proteomes. It systematically addresses the measles, HIV, influenza, potato virus, forest virus, bovine virus, hepatitis, and rotavirus as well as viral genomics. After analyzing the unique features of each class of viral proteins, future directions for research and disease management are presented. VLADIMIR N. UVERSKY is an Associate Professor at the Department of Molecular Medicine at the University of South Florida (USF). He obtained his academic degrees from Moscow Institute of Physics and Technology (PhD in 1991) and from the Institute of Experimental and Theoretical Biophysics, Russian Academy of Sciences (DSc in 1998). He spent his early career working mostly on protein folding at the Institute of Protein Research and Institute for Biological Instrumentation, Russia. In 1998, he moved to the University of California Santa Cruz where for six years he was studying protein folding, misfolding, protein conformation diseases, and protein intrinsic disorder phenomenon. In 2004, he was invited to join the Indiana University School of Medicine as a Senior Research Professor to work on intrinsically disordered proteins. Since 2010, Professor Uversky is with USF, where he continues to study intrinsically disordered proteins and protein folding and misfolding processes. He has authored over 400 scientific publications and edited several books and book series on protein structure, function, folding and misfolding. SONIA LONGHI is a Director of Research at the Center for the National Scientific Research (CNRS). She obtained her academic degree (PhD) from the University of Milan in 1993. She then went to the Architecture and Function of Biological Macromolecules laboratory (AFMB, UMR 6098, CNRS and Aix-Marseille University) where she did postdoctoral work on protein crystallography. Since 2006, she has been heading the "Structural Disorder and Molecular Recognition" group within the AFMB laboratory. She has authored more than 70 scientific publications and edited a book on measles virus nucleoprotein and coedited, with Prof. Vladimir Uversky, a book entitled Instrumental Analysis of Intrinsically Disordered Proteins (Wiley). 1. Do viral proteins possess unique features? (Vladimir Uversky). 2. Functional role of structural disorder in capsid proteins (Lars Liljas). 3. Structural disorder within the nucleoproteins and phosphoproteins of measles, Nipah and Hendra viruses (Johnny Habchi and Sonia Longhi). 4. Structural disorder within the Sendai virus nucleoprotein and phosphoprotein (Rob Ruigrok and Martin Blackledge). 5. Structural disorder in Rhabdoviridae phosphoproteins (Marc Jamin). 6. Structural disorder in matrix proteins from HiV-related viruses (Vladimir Uversky and Keith Dunker). 7. Structural disorder in proteins from influenza virus (Vladmir Uversky and Keith Dunker). 8. Structural disorder in the HIV-1 Vif protein and oilgomerization-dependent gain of structure (Assaf Friedler). 9. Order from Disorder: Structure, Function and Dynamics of the HIV-1 Transactivator of Transcription (Joe D. O’Neil). 10. Intrinsically disordered protein domains of the non structural proteins of Sesbania mosaic virus and their functional role (Handanahal S. Savithri). 11. Intrinsic disorder in genome-linked viral proteins VPgs of potyviruses (Jadwiga Chroboczek, Eugénie Hébrard, Kristiina Mäkinen, Thierry Michon and Kimmo Rantalainen). 12. Intrinsic disorder in HPV 16 E7 protein (Gonzalo de Prat-Gay). 13. The Semiliki forest virus serine protease is disordered and yet displays catalytic activity (Manuel Morillas). 14. Intrinsic disorder in the core proteins of Flaviviridae (Jean-Luc Darlix). 15. Domains 2 and 3 of non-structural protein 5A (NS5A) of hepatitis C virus is natively unfolded (Ho Sup Yoon). 16. Intrinsic disorder within phage λ N protein and interaction with the E. coli NusA protein (Kristian Schweimer). 17. The N-terminal extension region of Hordeivirus movement TGB1 protein consists of two domains with different content of disordered structure (V.V. Makarov, M.E. Tailansky, E.N. Dobrov, N.O. Kalinina).